The Beachfront Pool Villa, measuring 110sqm, has been designed to be bright and breezy. The villa offers a p+anoramic view of the Indian Ocean and opens on to a large sundeck that leads to the powder-soft beach. The nautilus shell-inspired ceiling and framed glass doors create a cocoon of relaxation and spaciousness. With its signature teakwood four-poster bed and extended wooden deck with sala overlooking Indian Ocean waters, living with nature becomes a breeze. The secluded garden setting of this villa is treasured for its privacy and shady greenery. The beach peeps through the leaves and entices you to soak up a golden tan. Laze around and see your footsteps disappear in the sand washed away by the ocean. 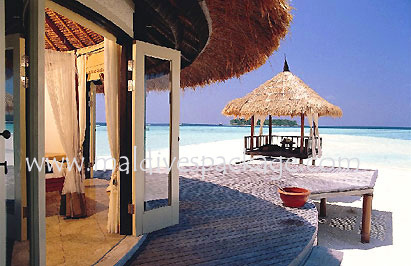 Stay at the awe-inspiring 120sqm Vabbinfaru Pool Villa for a beach hideaway with a personal touch. Enjoy the luxury of a large landscaped garden with ocean views, outdoor living pavilion with outdoor jet pool, beach sala pavilion, a walled garden, which comprises a sundeck, pool, jet pool, outdoor and indoor showers and a recessed sitting area perfect for a lazy afternoon lounging on the sundeck to soak up a golden tan. 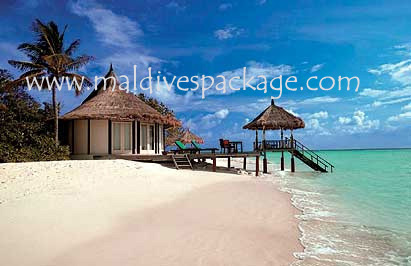 Ample space also makes the Vabbinfaru Pool Villa ideal for small wedding parties. If you venture beyond the pampered realm of your villa and the wonderfully slow Maldivian pace of life, you'll find a wealth of recreational diversions. For a start, you can dive or snorkel in the transparent brilliance of the ocean, explore its riches, and go deep-sea or night fishing. 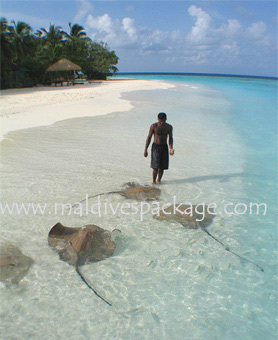 After all, this is a paradise renowned for superlative fishing, sailing, diving and snorkeling. 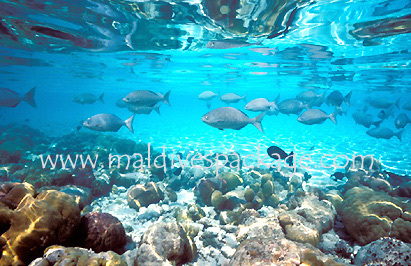 If you prefer, sit in the shallow waters and watch the myriad of exotic schools of fish dart in and out of the light. Enjoy a canoe ride with your partner or let our guide take you both on a leisurely catamaran ride. For more vigorous workouts, head for the resort's health & fitness room. And for the less actively inclined, a ramble around Malé exploring its sights and shopping, or a promenade along the beach are just as rousing. If the sun gets to you, simply retire to breezy Naboli bar for board games or some quiet reading.